Deaf culture is the set of social beliefs, behaviors, art, literary traditions, history, values, and shared institutions of communities that are influenced by deafness and which use sign languages as the main means of communication. When used as a cultural label especially within the culture, the word deaf is often written with a capital D and referred to as "big D Deaf" in speech and sign. When used as a label for the audiological condition, it is written with a lower case d.
Members of the Deaf community tend to view deafness as a difference in human experience rather than a disability or disease. Many members take pride in their Deaf identity. Deaf people, in the sense of a community or culture, can then be seen as a minority group, and therefore some who are a part of this community may feel misunderstood by those who don't know sign language. 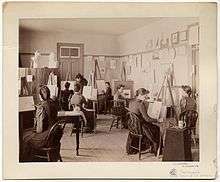 Another struggle that the Deaf community often faces is that educational institutions usually consist primarily of hearing people. Additionally, hearing family members may need to learn sign language in order for the deaf person to feel included and supported. Unlike other cultures, a deaf person may join the community later in life, rather than being born into it. There are three views on Deaf people. There is a Medical View, a view commonly associated with doctors and their pressuring of a Deaf child's parents that they should undergo surgery. They may even go as far as to urge parents not to learn American Sign Language believing that it will distract the Deaf child from developing his /her auditory and speech skills (although it is quite the contrary). The Social view welcomes Deaf individuals into the hearing world and provides Deaf people with accommodations such as interpreters. This view however, fails to recognize the unique situation Deaf children are in. Rather than attempting to understand Deaf culture, people with this view feel as though it is the duty of the Deaf individual to find their own way into a predominantly hearing society. Finally, there is the cultural-linguistic view. This properly recognizes Deaf people as a minority culture in the world with their own language, social norms, and culture. It promotes Deaf people's right to collective space within society to pass on their language and culture to future generations. Being involved in the Deaf community and culturally identifying as Deaf has been shown to significantly contribute to positive self-esteem in Deaf individuals. This community provides support, easy social interaction, and a "refuge from the grinding frustrations of the hearing world." Conversely, Deaf individuals who are not a part of the Deaf community are forced to conform to the hearing world, resulting in lower self-esteem. The community may include hearing family members of deaf people and sign-language interpreters who identify with Deaf culture. It does not automatically include all people who are deaf or hard-of-hearing. As educator and American Sign Language interpreter Anna Mindess writes, "it is not the extent of hearing loss that defines a member of the deaf community but the individual's own sense of identity and resultant actions." As with all social groups that a person chooses to belong to, a person is a member of the Deaf community if he or she "identifies him/herself as a member of the Deaf community, and other members accept that person as a part of the community." Deaf culture is recognized under Article 30, Paragraph 4 of the United Nations Convention on the Rights of Persons with Disabilities, which states that "Persons with disabilities shall be entitled, on an equal basis with others, to recognition and support of their specific cultural and linguistic identity, including sign languages and deaf culture." In 1972, Professor James Woodward, co-director of the Centre for Sign Linguistics and Deaf Studies at the Chinese University of Hong Kong since 2004, proposed a distinction between deafness and the deaf culture. He suggested using deaf (written with a lower case d) to refer to the audiological condition of deafness, and Deaf (written with an upper case D) to refer to deaf culture. This distinction has been widely adopted within the culture. A U.S. state regulation from the Colorado Department of Human Services defines "Deaf" (uppercase) as "A group of people, with varying hearing acuity, whose primary mode of communication is a visual language (predominantly American Sign Language (ASL) in the United States) and have a shared heritage and culture," and has a separate definition for "deaf" (lowercase). In Deaf culture, person-first language (i.e., "Person who is deaf", "person who is hard of hearing") has long been rejected since being culturally Deaf is seen as a source of positive identity and pride. Instead, Deaf culture uses Deaf-first language: "Deaf person" or "hard-of-hearing person". "Hearing-impaired" and "hard of hearing"
The term hearing-impaired is more likely to be used by people with a mild or moderate hearing loss and people who have acquired deafness in adulthood rather than by those who have grown up deaf. By contrast, those who identify with the Deaf culture movement typically reject the label impaired and other labels that imply that deafness is a pathological condition, viewing it instead as a focus of pride. The term "hard of hearing" is preferred over "hearing-impaired" within the American deaf community and accepted as a neutral term without negative or pathological connotations, with no implication about age of onset. An ASL term hard-of-hearing exists and is roughly equivalent to the English term. Deaf-mute is a literal translation of the French sourd-muet which was already in use in France in the 19th century, in the works of the founder of the deaf school in Paris, as well as in the name of the school, the Institution Nationale des Sourds-Muets à Paris. The word "dumb" had meant "speechless" for centuries in English, before it gained the sense of "stupid" as a secondary meaning in the 19th century. Historically, Deaf culture has often been acquired within schools for Deaf students and within Deaf social clubs, both of which unite deaf people into communities with which they can identify. Becoming Deaf culturally can occur at different times for different people, depending on the circumstances of one's life. A small proportion of deaf individuals acquire sign language and Deaf culture in infancy from Deaf parents, others acquire it through attendance at schools, and yet others may not be exposed to sign language and Deaf culture until college or a time after that. Educator and ASL interpreter Anna Mindess notes that there is "not just one homogeneous deaf culture". There are many distinct Deaf communities around the world, which communicate using different sign languages and exhibit different cultural norms. Deaf identity also intersects with other kinds of cultural identity. Deaf culture intersects with nationality, education, race, ethnicity, gender, class, sexual orientation, and other identity markers, leading to a culture that is at once quite small and also tremendously diverse. The extent to which people identify primarily with their deaf identity rather than their membership in other intersecting cultural groups also varies. Mindess notes a 1989 study, which found that "87 percent of black deaf people polled identified with their black culture first". Members of Deaf cultures communicate via sign languages. There are over 200 distinct sign languages in the world. These include 114 sign languages listed in the Ethnologue database and 157 more sign languages, systems, and dialects. While the United Kingdom and the United States are both predominantly English speaking, the predominant signed languages used in these countries differ markedly. Due to the origins of deaf education in the United States, American Sign Language is most closely related to French Sign Language. Sign language is just one part of deaf culture. Deaf identity is also constructed around specific beliefs, values and art. Deaf people also keep each other informed of what is going on in one's environment. It is common to provide detailed information when leaving early or arriving late; withholding such information may be considered rude. When giving introductions, Deaf people typically try to find common ground; since the Deaf community is relatively small, Deaf people usually know some other Deaf people in common. "The search for connections is the search for connectedness." Deaf individuals rely on technology for communication significantly. In the United States, video relay services and an array of freestanding and software-driven video phones are often used by deaf people to conduct telephonic communication with hearing and deaf businesses, family and friends. Devices such as the teletype (known as a TTY, an electronic device used for communication over a telephone line) are far less common, but are used by some deaf people who are without access to high-speed Internet or have a preference for these methods for their telephonic communication. Social media tends to be of great importance to deaf individuals. Networking sites allow the deaf to find each other and to remain in contact. Many deaf people have deaf friends throughout the entire country that they met or maintain contact with through online communities. Because the deaf community is so small, for many deaf people, the stigma of meeting others online does not exist. Religious work among the deaf and their use of technology includes the Deaf Bible App with contains the American Sign Language translation of the New Testament and portions of the Old Testament. Deaf artists such as Betty G. Miller and Chuck Baird have produced visual artwork that conveys a Deaf worldview. Douglas Tilden was a famous Deaf sculptor who produced many different sculptures in his lifetime. Deaf people who sign are intensely proud of their history. In the United States, they recount the story of Laurent Clerc, a deaf educator, coming to the United States from France in 1816 to help found the first permanent school for deaf children in the country. Deaf culture revolves around such institutions as residential schools for deaf students, universities for deaf students (including Gallaudet University, South West Collegiate Institute for the Deaf, and the National Technical Institute for the Deaf), deaf clubs, deaf athletic leagues, communal homes (such as The Home for Aged and Infirm Deaf-Mutes in New York City), deaf social organizations (such as the Deaf Professional Happy Hour), deaf religious groups, deaf theaters, and an array of conferences and festivals, such as the Deaf Way II Conference and Festival and the World Federation of the Deaf conferences. The Rainbow Alliance of the Deaf is a nonprofit established in 1977 to, "establish and maintain a society of Deaf LGBT to encourage and promote the educational, economical, and social welfare; to foster fellowship; to defend our rights; and advance our interests as Deaf LGBT citizens concerning social justice; to build up an organization in which all worthy members may participate in the discussion of practical problems and solutions related to their social welfare. RAD has over twenty chapters in the United States and Canada." There is also the American deaf resource center Deaf Queer Resource Center (DQRC), the Hong Kong Bauhinias Deaf Club, and the Greenbow LGBT Society of Ireland. There are deaf churches (where sign language is the main language), deaf synagogues, deaf Jewish community centers, and the Hebrew Seminary of the Deaf in Illinois. In 2011 the Conservative Movement unanimously passed the rabbinic responsa, "The Status of the Heresh [one who is deaf] and of Sign Language," by the Committee on Jewish Law and Standards (CJLS). This responsa declared that, among other things, "The Committee on Jewish Law and Standards rules that the deaf who communicate via sign language and do not speak are no longer to be considered mentally incapacitated. Jews who are deaf are responsible for observing mitzvot. Our communities, synagogues, schools, and camps must strive to be welcoming and accessible, and inclusive. Sign language may be used in matters of personal status and may be used in rituals. A deaf person called to the Torah who does not speak may recite the berakhot via sign language. A deaf person may serve as a shaliah tzibbur in sign language in a minyan whose medium of communication is sign language." There are 15 chapters of Deaf Women United throughout the United States; its mission is, "to promote the lives of Deaf women through empowerment, enrichment, and networking." There is also Pink Wings of Hope, an American breast cancer support group for deaf and hard-of-hearing women. Deaf people at the library have the same needs as other library patrons but often have more difficulty accessing materials and services. Over the last few decades, libraries in the United States have begun to implement services and collections for Deaf patrons and are working harder every year to make more of their collections, services, their communities, and even the world more accessible. One of the first activists in the library community working toward accessibility for the Deaf was Alice Hagemeyer. When disabled communities began demanding equality in the 1970s, Hagemeyer decided to go back to school for her master's degree in library science. While she was studying there, she realized that there was not very much information about the Deaf community at her library or at the libraries of any of her classmates. She soon became an activist for Deaf awareness at her library, and she became the first “Librarian for the Deaf Community” from any public library in the nation. Hagemeyer also constructed a manual of resources for Deaf people and those associated with them called The Red Notebook. This notebook is now an online resource, which is available at the website of the Friends of Libraries for Deaf Action. Hagemeyer was one of the first library activists to make strides for the Deaf community. 1 2 Padden, Carol A.; Humphries, Tom (Tom L.) (2005). Inside Deaf Culture. Cambridge, MA: Harvard University Press. p. 1. ISBN 978-0-674-01506-7. 1 2 Jamie Berke (9 February 2010). "Deaf Culture - Big D Small D". About.com. Retrieved 22 November 2013. 1 2 3 4 Ladd, Paddy (2003). Understanding Deaf Culture: In Search of Deafhood. Multilingual Matters. p. 502. ISBN 978-1-85359-545-5. ↑ Lane, Harlan L.; Richard Pillard; Ulf Hedberg (2011). The People of the Eye: Deaf Ethnicity and Ancestry. Oxford University Press. p. 269. ISBN 978-0-19-975929-3. ↑ James, Susan Donaldson; Huang, Grace (2006-12-13). "Deaf and Proud to Use Sign Language". ABC News. Retrieved 2015-08-31. ↑ Nash, Jeffrey E.; Nash, Anedith (1981). Deafness in Society. Toronto: LexingtonBooks. pp. 100–102. ↑ Lentz, Ella Mae., Ken Mikos, and Cheri Smith. Signing Naturally: Vocabulary Review, Level 2. San Diego, CA: DawnSignPress, 1993. Print. 1 2 Padden, Carol; Humphries, Tom (1988). Deaf in America: Voices from a Culture. Harvard University Press. p. 134. ISBN 978-0-674-19423-6. 1 2 3 4 5 6 7 8 9 Mindess, Anna (2006). Reading Between the Signs: Intercultural Communication for Sign Language Interpreters. ISBN 978-1-931930-26-0. ↑ Baker, Charlotte; Carol Padden (1978). American Sign Language: A look at its story, structure and community. ↑ "James Woodward biography". Deaf Dialogue. 24 August 2010. Retrieved 22 November 2013. ↑ "RULE MANUAL 27 COLORADO COMMISSION FOR THE DEAF AND HARD OF HEARING". Colorado Secretary of State. May 1, 2010. p. 15. Retrieved September 26, 2015. ↑ Lum, Doman (2010). Culturally Competent Practice: A Framework for Understanding. Cengage Learning. p. 441. ISBN 9780840034434. 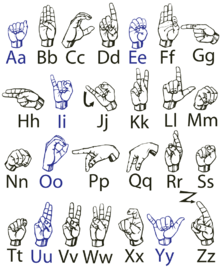 ↑ "Terminology Describing Deaf Individuals". Gallaudet University. Archived from the original on June 5, 2013. Retrieved June 29, 2013. 1 2 "Community and Culture - Frequently Asked Questions - Question -- What is wrong with the use of these terms "deaf-mute," "deaf and dumb," or "hearing-impaired"?". National Association of the Deaf. Archived from the original on 2015-12-27. Retrieved 2015-12-29. ↑ O’Conner, Patricia; Kellerman, Stewart (July 3, 2014). "The Grammarphobia Blog - Speaking of dumb". Archived from the original on 2015-09-05. Retrieved 2015-12-29. ↑ Mitchell, Ross E. & Karchmer, Michael A. (2004) Chasing the mythical ten percent: Parental hearing status of deaf and hard of hearing students in the United States. Sign Language Studies 4:2, 138–163. 1 2 3 4 Bauman, Dirksen (2008). Open your eyes: Deaf studies talking. University of Minnesota Press. ISBN 978-0-8166-4619-7. ↑ Harrington, Thomas. "Sign language of the world by name". Galllaudet University Library. Retrieved 24 July 2012. ↑ Harrington, Thomas. "Sign language of the world by name." n. page. Print. ↑ Gannon, Jack R (1981). Deaf Heritage–A Narrative History of Deaf America. Silver Spring, MD: National Association of the Deaf. p. 378. ISBN 978-0-913072-38-7. ↑ Rood, Rachel (May 12, 2013). "New Closed-Captioning Glasses Help Deaf Go Out To The Movies : All Tech Considered". NPR. Retrieved 2015-04-12. ↑ "Banks face massive payouts to deaf customers". Action On Hearing Loss / RNID. 2012-02-21. Archived from the original on 2013-06-04. Retrieved 2015-04-12. ↑ Tsymbal, Karina (2010). "Drum: Deaf Space And The Visual World – Buildings That Speak: An Elementary School For The Deaf". Hdl.handle.net. Retrieved 2012-04-15. ↑ "Matthew 1 | American Sign Language". Bible.is. 2015-04-02. Retrieved 2015-04-12. 1 2 Krentz, Christopher (2000). A Mighty Change: An Anthology of Deaf American Writing 1816–1864. Gallaudet University Press. ISBN 978-1-56368-101-1. ↑ Sonnenstrahl, Deborah (2002). Deaf Artists in America: Colonial to Contemporary. DawnSignPress. ISBN 978-1-58121-050-7. ↑ "Douglas Tilden facts and information". Deafness.answers.com. Retrieved 2015-04-17. ↑ "Ability Magazine: Sean Forbes – Not Hard to Hear" (2011)". Abilitymagazine.com. Retrieved 2012-04-04. ↑ Baynton, Douglas (1996). Forbidden Signs: American Culture and the Campaign against Sign Language. University of Chicago Press. ISBN 978-0-226-03964-0. ↑ "About Us". Nbda.org. Retrieved 2015-04-12. ↑ "Purpose". Deafrad.org. Retrieved 2015-09-26. ↑ Gianoulis, Tina. ">> social sciences >> Deaf Culture" (PDF). glbtq archive. Retrieved 2015-09-26. ↑ "Other LGBT Organisations". LGBT Diversity. Retrieved 2015-04-12. ↑ "A Rabbinical School for Deaf and Hearing". Hebrew Seminary. Retrieved 2015-04-12. ↑ Albrecht, Gary L, ed. (2006). Encyclopedia of Disability Volume 5 - Google Books. Books.google.com. ISBN 978-0-7619-2565-1. Retrieved 2015-04-12. ↑ "Churches for Deaf". Ohsoez.com. Retrieved 2015-04-12. ↑ DeFiglio, Pam. "Hebrew Seminary of the Deaf". Patch. Archived from the original on 2013-09-11. ↑ Tomchin, Susan (April 2012). "Hearing the Needs of the Jewish Deaf". Jewish Women International. Retrieved September 26, 2015. ↑ Laird, Grant, Jr. (2011-06-20). "JDRC Salutes Conservative Judaism's Ruling to Include Deaf Jews as Equals | Deaf Network of Texas". Deafnetwork.com. Retrieved 2015-04-12. ↑ "About Us". Deaf Women United. Retrieved September 26, 2015. ↑ "Who is Pink Wings of Hope?". Pink.deafinc.org. 2009-10-11. Retrieved 2015-09-26. ↑ "Library Services for People with Disabilities Policy | Association of Specialized & Cooperative Library Agencies (ASCLA)". Ala.org. 2001-01-16. Retrieved 2015-04-17. ↑ Hagemeyer, A. L. (2001). Achievement: From a lack of knowledge to an appreciation of Deaf history. IFLA Conference Proceedings, 1–3. ↑ McQuigg, Karen (August 2003). "Are the deaf a disabled group, or a linguistic minority? Issues for librarians in Victoria's public libraries". Australian Library Journal. 52(4). Archived from the original on May 31, 2004. ↑ Day, J. M. (2000). Guidelines for library services to deaf people (Report no. 62). The Hague: International Federation of Library Associations and Institutions. ↑ Hollander, P. (1995). Deaf-advocacy at Queens Borough PL. American Libraries, 26(6), 560–562. ↑ Harrington, T.R. (1998). The Deaf collection at the Gallaudet University Library. Education Libraries, 22(3), 5-12. ↑ Cohen, S. (2006). Have you heard about the Library Services for the Deaf & Hard of Hearing? Tennessee Libraries, 56(1), 51–56. Berbrier, Mitch. "Being Deaf has little to do with one's ears": Boundary work in the Deaf culture movement. Perspectives on Social Problems, 10, 79–100. Moore, Matthew S. & Levitan, Linda (2003). For Hearing People Only, Answers to Some of the Most Commonly Asked Questions About the Deaf Community, its Culture, and the "Deaf Reality", Rochester, New York: Deaf Life Press. "Deafness is not a disability" (argumentum ad consequentiam) Article discussing the controversy.